CHANGES TO FRONT ROW REGULATIONS EC1N, S,W. 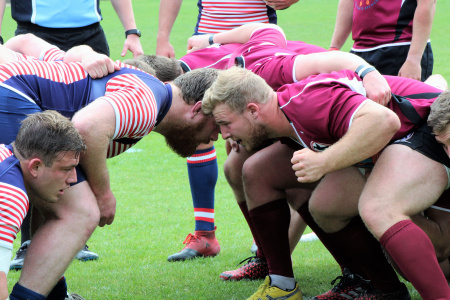 Following the recent consultation exercise, EC clubs voted for a change in the Regulations relating to the requirement for front row (FR) replacements within the EC1 Leagues. Accordingly, the following will apply with immediate effect. All other Regulations remain unchanged. For the avoidance of doubt, there is no change to the requirement that teams must be able to start the game legitimately being able to contest the scrummage with a fully capable and trained front row. If a FR player is injured, he can only be replaced by someone who is capable of playing in the front row such that scrummages may continue to be contested. If the injured FR player CANNOT be replaced by another FR player he CANNOT be replaced at all, and that team will continue with 14 men (or fewer if they are already short of 15). The game will go to uncontested scrums. The result of the match will stand- i.e. it will not be forfeited. If, subsequently, the same team loses another one or two FR players to injury, they may be replaced subject to the normal replacement conditions (no more than 8 interchanges). Whilst this concession is designed to ensure that teams will be able to fulfil their playing fixtures they are advised and encouraged to have FR replacement(s) but will not be penalised if they are unable to do so.